SONOSIM SUMMARY: This blind observational study sought to measure the effectiveness of using transthoracic ultrasonography (TUS) as a diagnostic tool for patients with dyspnea. In the study, findings from TUS were compared against corresponding computed tomography (CT) images (i.e., the gold standard for evaluating dyspneic patients). While the study did demonstrate a correlation between varying pleural & B-line pathology on TUS and their associated CT findings, TUS findings were somewhat limited in their specificity. The study concludes that TUS may be a valuable tool in the initial assessment of ED patients who present with dyspnea. Li H, Li YD, Zhu WW, et al. High-resolution transthoracic ultrasonography for assessment of pleural lines in patients with dyspnea with CT comparison: an observational study. J Ultrasound Med. 2017 Apr;36(4):707-716. Detection of B-line in dyspneic patients is often accompanied by abnormal changes of pleural line on transthoracic ultrasonography (TUS). The aim of the study was to evaluate the relevance and diagnostic performance of pleural line abnormalities and B-lines detected on high-resolution TUS against the computed tomography (CT) findings. Transthoracic ultrasonography was performed in patients admitted to the emergency department with dyspnea. 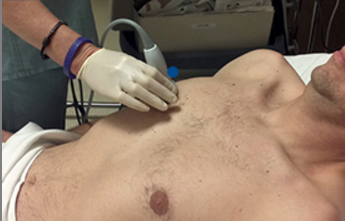 The pleural line and accompanying B-line were assessed using a linear transducer. The TUS findings were assessed against the corresponding high-resolution CT findings in the same location, which were considered to be the gold standard. Out of a total of 116 patients, 68.1% had changes of the pleural line on TUS. The characteristic changes of the pleural line were classified into four types: slightly rough pleural line with confluent B-lines on TUS corresponded with CT findings of ground-glass opacity; irregular and interrupted pleural line with confluent B-lines corresponded with parenchymal infiltration; fringed pleural line with confluent B-lines corresponded with superimposed ground-glass and irregular reticular opacities; and fringed pleural line with scattered B-lines corresponded with irregularly thickened interlobular septa. Wavy pleural line indicated subpleural emphysema. The coexistence of more than one abnormal pleural line was also found in 31 cases (26.7%). High-resolution TUS may help in the initial assessment of lung pathology by its ability to identify pleural line abnormalities and B-lines that are shown to be associated with CT, which could add diagnostic value in the emergency evaluation of dyspneic patients.